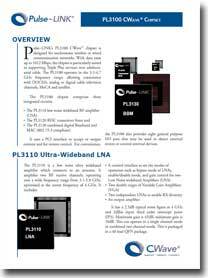 Carlsbad, Calif. – December 13, 2007 – Pulse~LINK, Inc., a pioneer of Ultra Wideband (UWB) communications, announced today that its recently released CWave® UWB chipset has been validated in independent testing to have the world’s highest data rate available for wireless networking. A comprehensive test of UWB products, conducted by octoScope, showed CWave’s 1.35 Gbps over-the-air signaling rate delivering 890 Mbps application layer throughput. CWave performance was 15 to 20 times greater than all other wireless UWB products measured in the test, the best of which peaked at around 50 Mbps at close range. A full report on the independent UWB test results was published in this week’s EE Times and Wireless Net DesignLine. Results of wireless range were also impressive in the octoScope testing, which reported: “The CWave throughput held at around 500 Mbps at up to 8 feet of wireless range and over much of the coaxial range. CWave sustained throughput of 115 Mbps up to 40 feet, at which point we ran out of space in the test facility.” The CWave chipset also measured sustained TCP/IP throughputs of 500Mbps across 450 feet of coaxial cable. Quality of Service (QoS) and High Data Rate performance are necessary for whole-home high definition video distribution. Devices enabled with the CWave® UWB chipset allow consumers to access high-bandwidth HD content from entertainment source devices in one room and display it on any HDTV in the house, utilizing the home’s existing coax cabling. Pulse~LINK CWave® UWB wireless solution reduces the “rat’s nest” of connector wires behind entertainment systems, enabling clean installation of wall-mounted flat-panel displays anywhere in the room. The HDMI extender enables longer-range, secure wireless connectivity between the HDTV display and multiple entertainment source devices such as set-top boxes, video game consoles, DVRs, Blu-ray DVD and HD DVD players. Pulse~LINK CWave® 802.15.3b MAC was designed from the ground up to support the QoS demands of isochronous streaming of audio, HD video and High Data Rate digital networking across all available PHY transports media within the home. “Architecturally, CWave appears to offer a significant advantage over the status quo of video transport products requiring disparate MACs to support different media,” stated Mlinarsky. Pulse~LINK CWave® technology was the only UWB device capable of multi-stream HD video transport in the tests and the only device supporting coaxial cabling in addition to wireless. CWave® high-volume commercial chipsets are available now and the company is introducing reference design kits for its CWave® UWB Wireless HDMI, HDMI-Over-Coax, Ethernet-Over-Coax and 1394-Over-Coax solutions. The RDKs are low cost, small form factor, production ready reference designs, enabling OEM customers quick market entry. All four “flavors” of the CWave® HD home networking technology will be showcased at the 2008 International Consumer Electronics Show (CES) in Las Vegas, Nevada, January 7-10, in the Pulse~LINK booth (South Hall 2- #25559) and various partner locations throughout the show floor. The UWB performance test was coordinated by industry expert Fanny Mlinarsky, a highly-regarded consultant with more than 24 years of senior R&D expertise in wireless technologies. Mlinarsky is president of octoScope, a Boston area consultancy. She is also the founder of Azimuth Systems, a test equipment company specializing in wireless technologies. In August, she published a three-part analysis of IEEE 802.11n systems: Testing Draft IEEE 802.11n systems: Not all “n” is created equal. Pulse~LINK, Inc. is a privately held Delaware Corporation headquartered in Carlsbad, California, with over 300 issued and pending patents pertaining to UWB wired and wireless communications technology. Pulse~LINK CWave® solution delivers up to Gigabit data rates over coax and wireless networks from the same chipset, providing consumers with the unprecedented ability to stream and distribute high quality multimedia content throughout the home. CWave® solutions support simultaneous operation of 1394, Gigabit Ethernet, and HDMI over coax and wireless connections. For additional information about Pulse~LINK, Inc., please visit: http://www.pulselink.net.